Noah Fecks The artist M. Henry Jones in his former studio. He is soliciting donations for a new project. An artist who had to move to new digs because of rising rent is asking for a few bucks through Kickstarter — and offering some unique incentives. 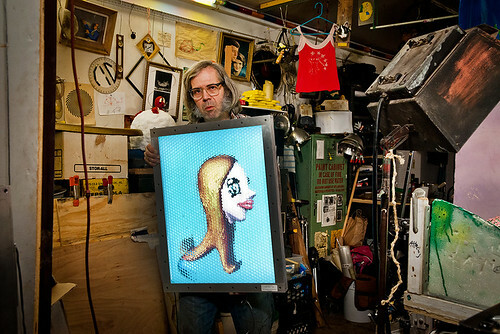 M. Henry Jones, the longtime East Village resident who moved his studio to East 10th Street after a new tenant offered to pay nearly four times his rent on Avenue A, is soliciting donations for his new project: a series of portraits and animations covered in lens screens that make them look three-dimensional. The portraits are done using Mr. Jones’ own “Fly’s Eye 3-D technique,” a method that allows viewers to see depth in the images without the need for 3-D glasses. So far, he has $2,000 towards his goal of $11,000 by July 29. The prizes for those who pledge money include lenticular mirrors, 3-D postcards, a signed coffee table book and — for a cool $5,000 — a “Giant Prototype SnakeMonkey Fly’s Eye 3D Lightbox.” The money will go toward buying materials to make the lens screens, frames and the panels that light up the portraits, according to the project’s description. Mr. Jones’ old studio at 202 Avenue A will soon house a high-end showroom for audio-visual equipment called Bright Audio. M. Henry Jones The pitch on Kickstarter.